An interior rendering of the under-construction Exchange Street Station. Located near popular destinations such as Canalside and KeyBank Center, the new station will be constructed on the same grounds as the existing 66-year-old Amtrak Station but will be elevated and moved closer to the street to improve access and visibility. The new station will be woven into Buffalo’s urban fabric, with improved connectivity to the city’s light rail system–via a new covered pedestrian plaza–and increased accommodation for vehicles, pedestrians and bicyclists. Seating capacity at the facility will increase from 20 to 40 persons, while the image of a Buffalo will also be featured at the center of the station’s Terrazzo floor. The existing station’s low-level platform will be replaced by a new train-level platform for easier boarding. The new station will also include a Taste NY kiosk that will provide food and beverage choices for passengers. Energy efficient and environmentally friendly materials will be used in the new station’s construction and the facility will be compliant with the Americans with Disabilities Act. A planned second phase of the project will expand the station further to accommodate intercity bus service and additional train routes, creating a truly intermodal transit center for downtown Buffalo. October 2016 – Governor Cuomo issued a $1 million, six-month challenge to City of Buffalo Mayor Byron Brown to convene a group of stakeholders, hire a consultant to provide technical information and expertise to guide the discussion, and to ultimately recommend the ideal location for a new, modern train station. April 2017 – A committee convened by Mayor Brown chooses the current Amtrak station location as the location of the new station. The project calls for the old station to be demolished and the new, larger station built at the same location. A temporary station will be erected to service passengers during the construction process. December 2018 – To save time and reduce costs, a $27.7 million contract was awarded that will employ the design-build project delivery method where both the engineering design and the construction of a project are contracted by a single entity known as the design-builder. The project is expected to be completed in the Fall of 2020. 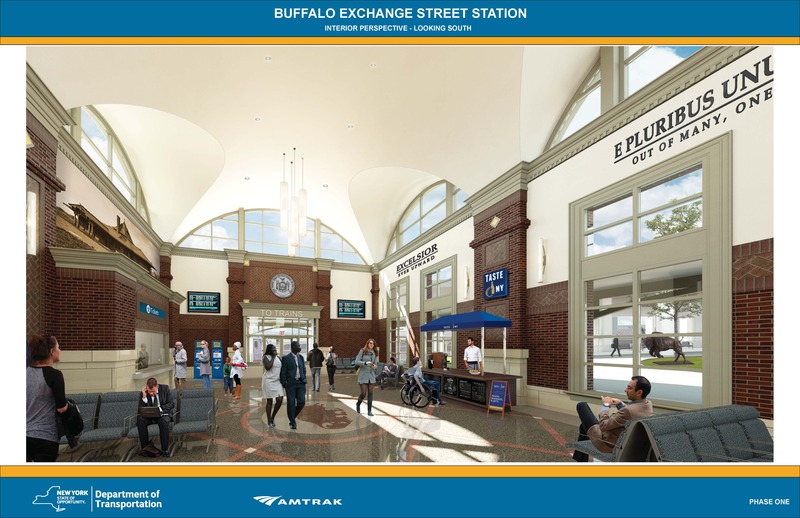 The new Exchange Street Station, an intermodal transportation hub, will be twice the size of the existing rail station and offer travelers an interconnected gateway to Downtown Buffalo. The state-of-the-art transportation center will bring travelers directly into the heart of the city and offer easy connections to bus and light rail service. It will promote economic activity and tourism for the area’s many attractions. Buffalo Billion funds totaling $25 million have been allocated for this $29.85 million project. The current small, non-descript Amtrak Exchange Street Station is deteriorating and overwhelmed by the Thruway and its elevated on-and-off ramps. It is unfit as the gateway to New York’s second largest city, and demands replacement.